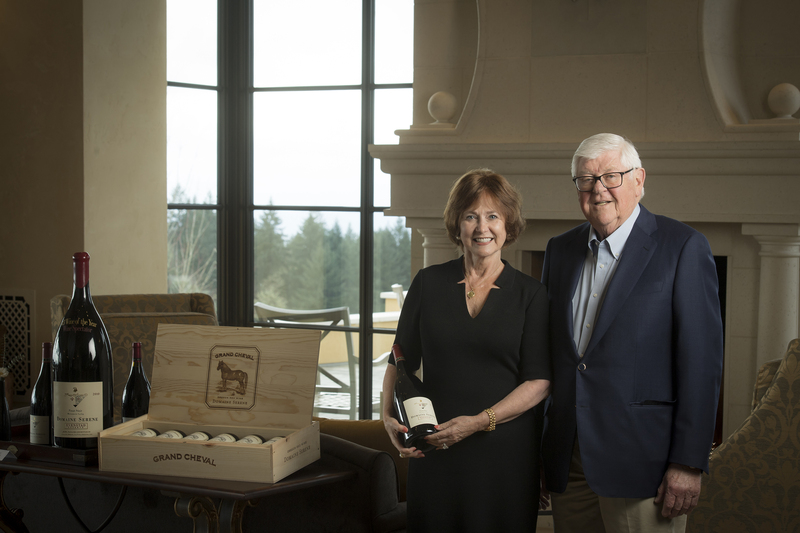 MCMINNVILLE, ORE. • Domaine Serene Winery founders Grace and Ken Evenstad have pledged $6 million to Linfield College, the largest gift in Oregon history in support of wine education. The gift is also one of the largest donations in Linfield's history and will allow the college to significantly expand its wine education program, which already offers the first interdisciplinary liberal arts bachelor's degree in wine studies in the United States. The gift will endow the Grace and Ken Evenstad Center for Wine Education at Linfield, as well as an endowed faculty position, the Evenstad Chair in Wine Studies. It will also fund the design and construction of the Evenstad Wine Laboratory as part of a new science building under development on the college's McMinnville campus. Traditional viticulture and enology programs focus primarily or exclusively on the craft of growing grapes and making wine. In contrast, the Grace and Ken Evenstad Center for Wine Education will include a Wine Studies degree that incorporates the historical, geographical and environmental aspects of growing grapes and the making, bottling and selling of wine, as well as coursework on sensory-evaluation techniques and industry-specific communication issues. Linfield currently offers a wine studies minor that can be paired with other academic programs, and is in the process of developing a standalone major. The Center for Wine Education at Linfield also offers wine management and wine marketing certificates online, holds a wine lecture series, provides a summer Wine Industry Immersion Program and hosts one of the world’s premier wine events—the International Pinot Noir Celebration—each summer. The Oregon Wine History Archive is housed at Linfield. In June 2017, internationally known wine climatologist Gregory V. Jones succeeded Ellen Brittan, the founding director of the Center for Wine Education. Jones will become the first to hold the Evenstad Chair in Wine Studies title. The Evenstads and Linfield share a goal of helping support Oregon’s wine industry as it develops into one of the world’s premier grape-growing and wine-producing destinations. Charitable giving is an essential part of the fabric that makes up the culture at Domaine Serene and the legacy of Grace and Ken Evenstad. With the Linfield gift, the Evenstads have now donated or raised more than $20 million for philanthropic causes nationwide. Grace and Ken Evenstad founded Domaine Serene in the Dundee Hills of Oregon in 1989. For the past 29 years, Domaine Serene, under the guidance of the Evenstads, has been focused on excellence in a never-ending quest to produce world-class Pinot Noir and Chardonnay. Domaine Serene’s wines represent the achievement that is possible in Oregon, one of the finest regions in the world for Pinot Noir and Chardonnay. The partnership between Domaine Serene and Linfield is already underway, with on-site educational programs hosted by the winery and a January study-abroad trip for Linfield students that included a visit the Evenstad’s French winery, Château de la Crée in Burgundy. Founded in 1858, Linfield is a four-year liberal arts college with campuses in McMinnville and Portland, Oregon. Twenty-five percent of Linfield students are the first in their families to attend college, and more than one-third are American students of color. The U.S. State Department honored Linfield for being Oregon’s top producer of Fulbright Scholars in 2017-18. Grace and Ken Evenstad founded Domaine Serene in the Dundee Hills of Oregon in 1989. The Evenstads had faith and confidence in Oregon early on, before there was a national market for Pinot Noir and Chardonnay from the region. Today, Domaine Serene produces wines from six individual vineyard estates, planted exclusively to Pinot Noir and Chardonnay. Each estate offers a diversity of soils, clones, rootstocks, microclimates, slopes and elevations that add distinguishing complexity and elegance to the wines. They broke ground in 2017 for their Chardonnay and Sparkling winery, the first dedicated white winery of its kind in Oregon, and will debut their new Sparkling Wine program that is scheduled for release in the summer of 2018. 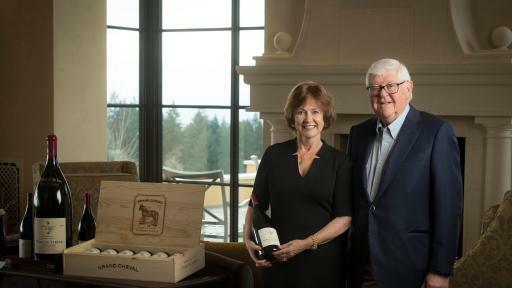 In 2015, Ken and Grace acquired Château de la Crée, the respected wine estate located in the birthplace of Pinot Noir and Chardonnay, the renowned Côte d'Or. This made them the first Oregon-based vintners to own land and produce wines in Burgundy, France. In total, the Evenstads own 950 total acres of land in the hills of Yamhill County, with 287 acres planted to vine, and 25 acres, comprised of over forty percent Premier Cru vineyards, in the Côte de Beaune region of Burgundy. In 2017, Domaine Serene opened a new best-in-class hospitality center, the Clubhouse at Domaine Serene, that is changing the landscape of fine wine hospitality in the Pacific Northwest. For the past 29 years, Domaine Serene, under the guidance of the Evenstads, has been focused on excellence in a never-ending quest to produce world-class Pinot Noir and Chardonnay. Domaine Serene’s wines represent the achievement that is possible in Oregon, one of the finest regions in the world for Pinot Noir and Chardonnay.